Suffice it to say, I’ve never been one of those people that can give up candy or sweets for the sake of “healthy eating”. Which is why the recipe I am about to share with you is a little bit shocking. My sister Bethany actually shared a recipe on her Facebook wall, originally from a blog called “Texanerin” (as in, a lovely and talented girl Erin from Texas). This recipe was for Peanut Butter Chocolate Chip Cookie Dough Bites, which doesn’t sound all that difficult to like, right? 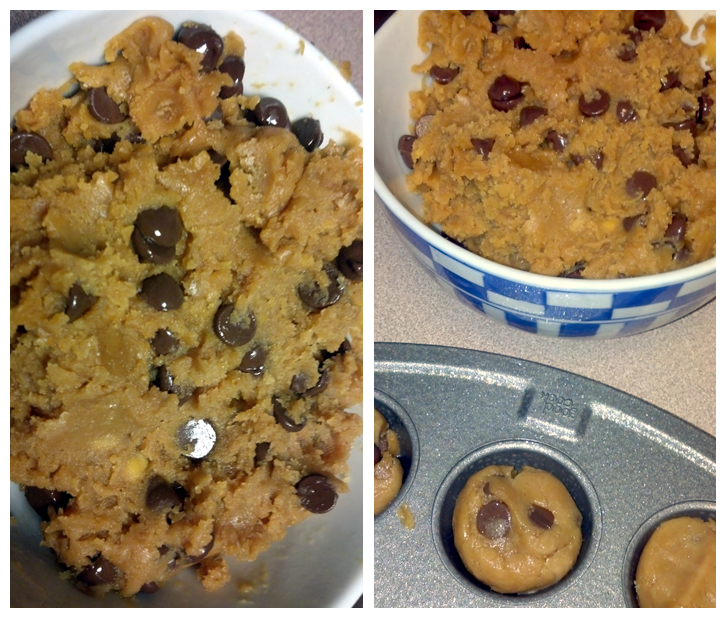 Well, hold your horses, because these are no ordinary PB/Choc-Chip Cookie Dough bites. Oh no. They involve 6 ingredients, and the first (and primary) one was the real shocker for me. Can you spot it? Preheat your oven to 350°F. 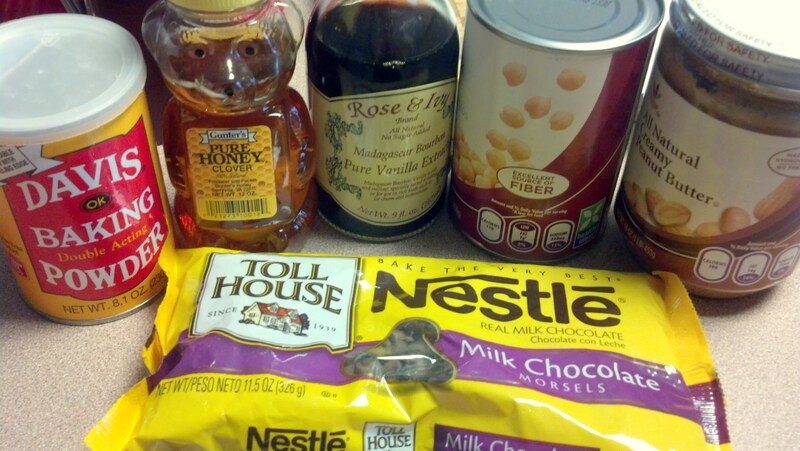 Then combine all the ingredients, except for the chocolate chips, in a food processor in order to have smooth un-bean-like dough. . . which is fine but I don’t have a food processor (shocking, I know). SO, I used my blender, although it was not exactly ideal. . . the dough is a little too sticky to blend very well, but I’ll have to try again. Just be sure to scrape the sides a lot, whatever you do, so that your “dough” stuff isn’t chick-pea-ish. At this point in the process, I was highly, highly skeptical. Next add the chocolate chips (I didn’t measure so much as eye-ball it and drop a handful or two in) and mix it together for a bit. The dough is very thick and a bit sticky, although I didn’t find it too bad. Plus, shockingly enough, it tasted good! 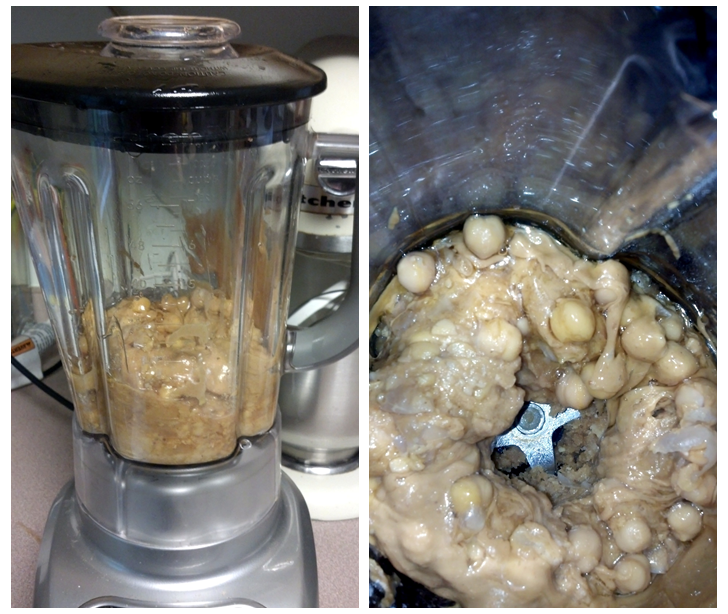 Seriously, the PB gets rid of the garbanzo bean taste, and you actually can’t get salmonella from eating this stuff. . . just a thought. Then, roll the dough into little balls. 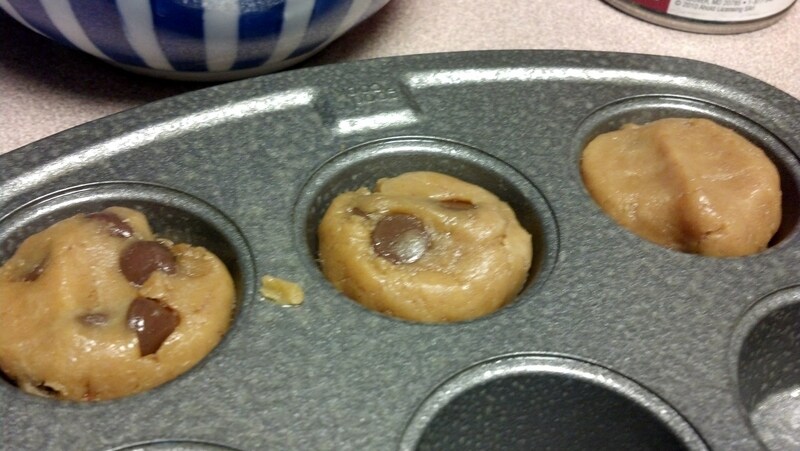 The original recipe says to put these onto parchment paper and bake as cookies, but I just rolled them and stuck them into a mini-muffin tin, because it seemed like it would make them easier to manage. 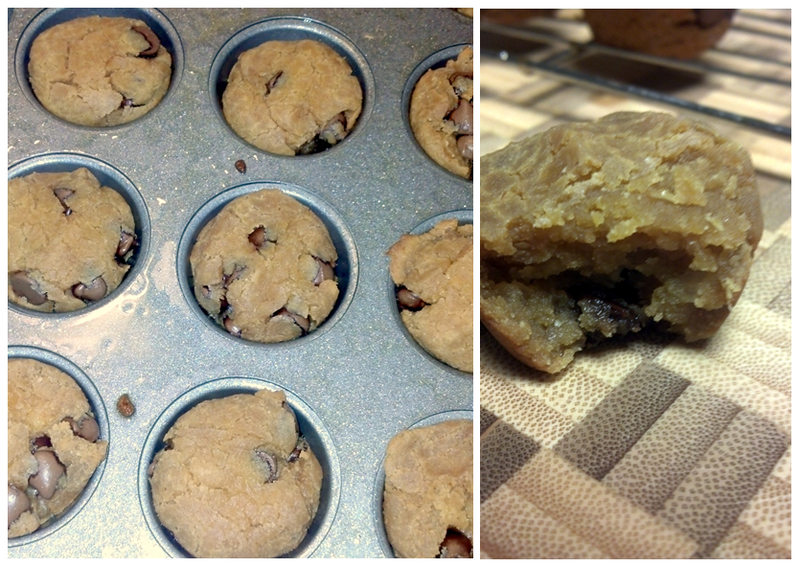 It might be a good idea to use mini chocolate chips too, if you plant to make these a little as I did! As recommended, I pressed them down a little bit, because they really don’t do very much shape changing in the 10-12 minutes they spend baking (10 for littler ones!). This recipe made about 24 mini-muffin-sized cookies! These little guys are best eaten warm, but still tasty cold! My verdict? These are good! Seriously. Remember how I’m a type 2 sweet-a-holic? (watch that second video clip again if you don’t know what I mean) . . . I think that officially makes me a connoisseur of sorts. I mean, yes, you can tell that these are not your typical chocolate chip cookie when you try them, but they are still really good as a dessert! AND, they are a nice little kick of protein and fiber in your diet, should those be lacking. PLUS, they have no processed oils or crazy sugars (depending on your chocolate chip brand, I suppose). In fact, how they wind up tasting good is kind of a mystery to me. First I wondered if there was something wrong with my taste buds, but I even had 6 blind taste-testers at work who approved wholeheartedly of the tasty-factor BEFORE I told them that it was chick-pea based, so I think it is officially legit! So, there you have it: Chocolate Chick Cookie bites, ladies and gentlemen. Give them a whirl and see how you feel!